2018 vs. 2019 Audi A6: What's the Difference? The update to Audi's midsize sedan is more than skin deep. 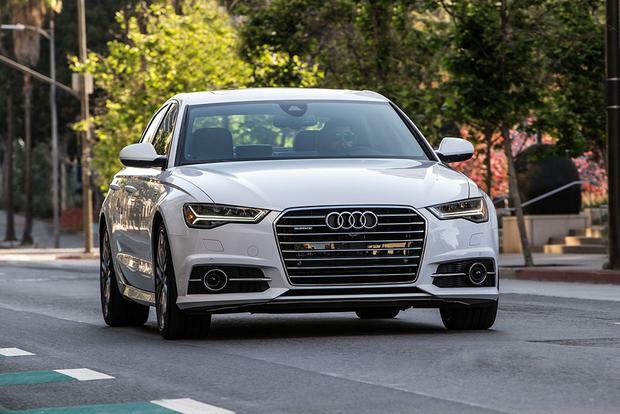 The 2019 Audi A6 premium midsize sedan marks a long-awaited new generation. The e-tron Crossover might give Tesla some real competition. Although the premium midsize sedan class keeps evolving, the 2018 Audi A6 remains fit enough to survive and thrive. 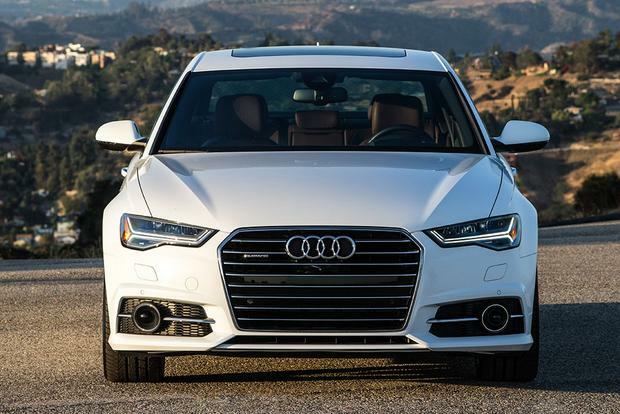 The sleek, swift and stylish 2016 Audi A6 3.0T executive sedan states its case in five compelling ways. The 2016 Audi A6 is the perfect example of a midsize executive sedan, blending elements of luxury, sport and high style. With available all-wheel drive, the A6 is a bona fide driver's machine. In contrast, the once-unrivaled BMW 5 Series has softened and the Lexus GS keeps improving, but a properly equipped A6 is arguably the best drive in its class. The trump card might be the optional turbocharged diesel (TDI) V6. Developing 240 horsepower and a breathtaking 428 lb-ft of torque, the A6 TDI can really move, and with an estimate of 38 miles per gallon on the highway, this version rates as one of the best combinations of performance and efficiency. Every A6 has a beautifully crafted interior with cutting-edge technology. The exterior's clean, understated lines are another way of swaying a buyer. It's subtle, but the A6's styling has been refreshed for this model year with a new grille, headlights and taillights. The gasoline engines in the range receive bumps in power for more impressive numbers. The infotainment system has a faster processor, 3D-animated graphics and Wi-Fi is updated from 3G to 4G LTE. The entry level engine is a 2.0-liter turbocharged 4-cylinder making 252 hp and 273 lb-ft of torque. This comes with front-wheel drive and the S-tronic CVT, returning 24 mpg in the city, 35 mpg hwy and 28 mpg combined. 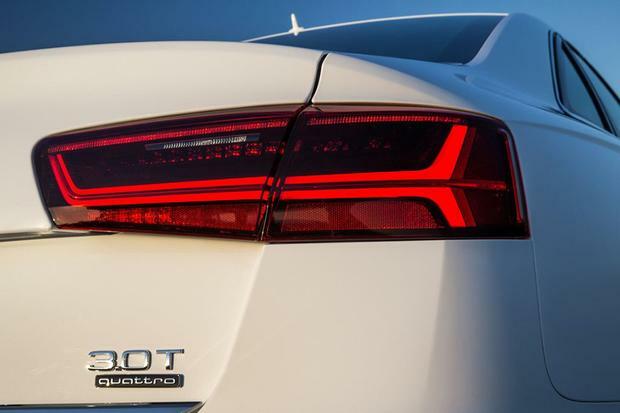 The same engine with all-wheel drive (Audi calls its system quattro) and the 8-speed conventional automatic transmission achieves 22 mpg city/32 mpg hwy and 26 mpg combined. Next up is a supercharged 3.0-liter V6, producing 333 hp and 325 lb-ft of torque. This has the 8-speed transmission and all-wheel drive as standard, using gasoline to the tune of 20 mpg city/30 mpg hwy and 24 mpg combined. There are no power changes to the 2016 TDI, but this turbodiesel, 8-speed auto and all-wheel drive combo makes a decent 240 hp with a glorious 428 lb-ft of torque while hitting 25 mpg city/38 mpg hwy and 29 mpg combined. It's generally accepted that improving those Environmental Protection Agency figures is possible without too much effort. 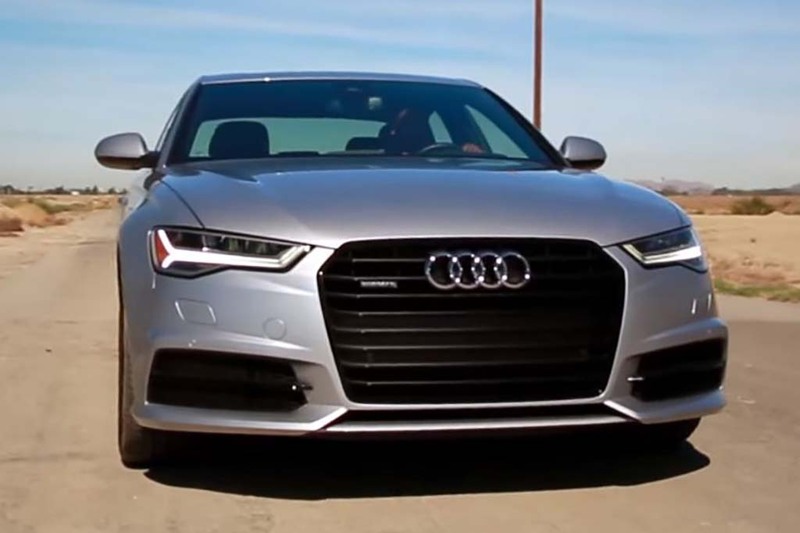 The 2015 Audi A6 comes in Premium, Premium Plus and Prestige trim levels. The 2.0T engine is offered in Premium or Premium Plus, while the 3.0T and TDI engines are offered in Premium Plus or Prestige. The 2.0T Premium starts with 18-inch alloy wheels, xenon headlights with LED accents, LED taillights, a sunroof, keyless entry with push-button ignition, Audi's Drive Select system (featuring electronic adjustment for steering, throttle and transmission responses), leather upholstery, tri-zone automatic climate control (including separate rear controls), power front seats (heated in the 3.0T) with driver lumbar adjustment, a tilt-telescopic steering wheel, Bluetooth, 10-speaker audio system and MMI Radio Plus (a basic version of Audi's Multi Media Interface) that includes a 6.5-in power-retracting thin-film-transistor display, iPod integration, a console-mounted control knob and twin SD card slots. The 2.0T Premium Plus adds front and rear parking sensors, upgraded 8-in color driver information display, Audi Connect online services (including mobile Wi-Fi), navigation with Google Earth compatibility and voice recognition software, plus an upgraded MMI interface with a handwriting recognition touchpad. Both 2.0T trims come standard with a CVT and front-wheel drive; all-wheel drive is an option, bringing the 8-speed conventional automatic transmission with it. Apart from the supercharged V6 engine, all-wheel drive and 8-speed automatic transmission as standard, the 3.0T Premium Plus largely shares the inventory of the 2.0T Premium Plus, while the TDI Premium Plus replaces the supercharged gasoline V6 for the turbodiesel V6. The 3.0T Prestige brings Audi's S line chromed window frames and exhaust tip, LED headlights, cooled seats, power tilt-telescopic steering wheel, head-up display, quad-zone automatic climate control (including two sets of controls for rear passengers) and an upgraded Bose audio system. The TDI Prestige substitutes the turbodiesel V6. Many features in the higher trims are available as options on lower trims. Also on offer is a Bang & Olufsen audio system, adaptive cruise control, a Black Optic appearance package and a Sport package featuring a lowered suspension, a 3-spoke steering wheel with shift paddles and 19-in or 20-in wheels. 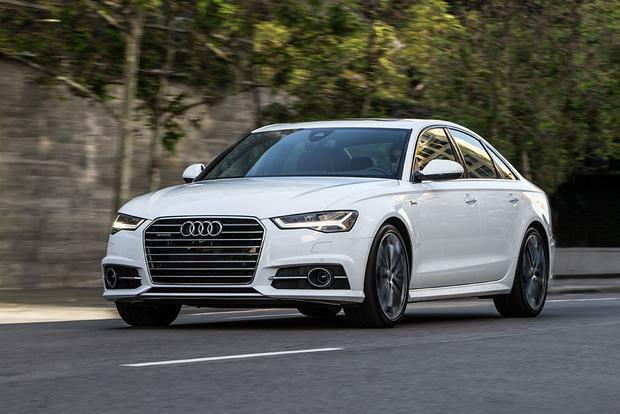 The 2016 Audi A6 comes with standard stability control and 4-wheel anti-lock disc brakes. Ventilated rear brake discs are fitted to 3.0T models; the 2.0T has solid rear discs. Eight airbags are standard (front, front-side, front-knee and full-length side-curtain), and rear-side airbags are optional. Numerous advanced safety technologies are included with the optional Driver Assistance package, including Audi Pre-Sense Plus and a collision-mitigation system with autonomous braking. 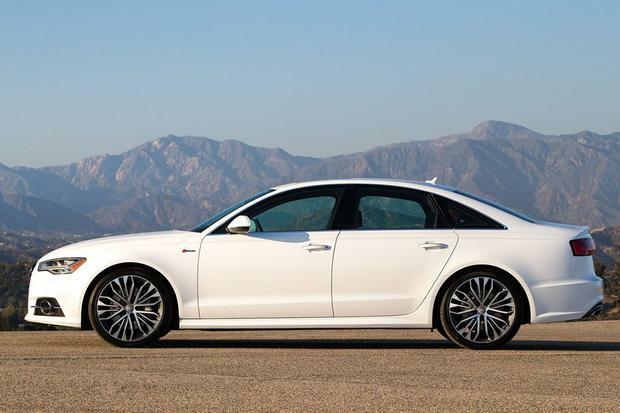 In government crash tests, the A6 received a top 5-star rating in every category. Likewise, the independent Insurance Institute for Highway Safety gave the A6 its top rating of Good across the board. The A6's cabin is a thing of beauty. Materials are exceptional, and practically every button, lever and knob oozes class. However, the rear seats are disappointing. The bottom cushion is rather low, so passengers with longer legs may notice a lack of under-thigh support. On the plus side, the rear section has separate climate controls, adding dual-zone functionality in Prestige models. The entry level CVT is an imprecise tool, although it does return solid fuel economy. The 2.0T's optional 8-speed conventional automatic transmission, which comes with all-wheel drive, is preferable, imparting a crisper, sportier feel. If performance is a priority, skip the 2.0T and go straight to the 3.0T or the TDI. The former is exceptionally refined and delivers authoritative acceleration into illegal territory, while the latter is almost as fast and more fuel efficient. If we were being picky, we might ask for smoother gearshifts, particularly in manual mode, and giving the horses a chance to gallop. 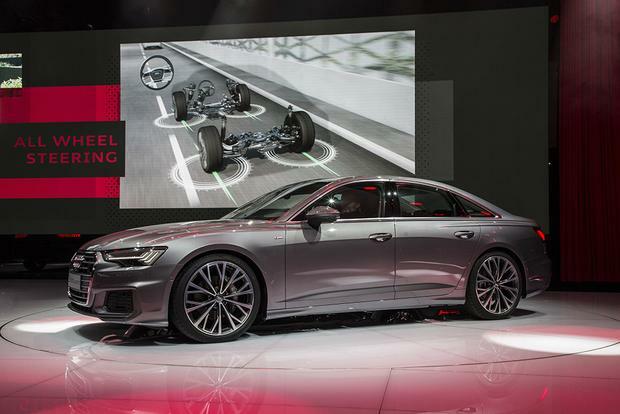 Although the A6 uses a front-drive platform, its weight distribution has never been more balanced, and the all-wheel-drive system can send up to 60 percent of torque to the rear wheels for improved control. The result is a car that feels smaller and lighter than it really is, especially with one of the Sport packages. The ride isn't as smooth as in some other luxury sedans, though, so resist the temptation to order those gorgeous 20-in wheels. 2016 BMW 5 Series -- The diesel-powered 535d competes well with the A6 TDI, and the 445-hp 550i would crush any A6 at a drag strip. On a winding road, the Audi regains the edge. 2015 Lexus GS -- The GS comes with both V6 and hybrid options, and it's as confident through the corners as any rival. 2016 Mercedes-Benz E-Class -- E-Class driving dynamics are conservative in comparison to the A6, but the Benz has undeniable quality in every aspect, and its powertrains are fully competitive. Used Audi A7 -- For the same price as a new A6, you could get a lightly used A7, which is essentially a sportier A6 with a sleek hatchback body. Shop around for a certified pre-owned model and enjoy the comprehensive warranty. Since there can only be one, seriously consider the TDI for its incredible fuel economy and turbocharged punch. Yes, it's the most expensive, but it's also pretty special.